Fuze lets you attend Fuze sessions on your Android smartphone. Fuze brings the office to your smartphone with high definition video conferencing, content sharing, and audio conferencing. Want to host your own Fuze sessions? Hosting a Fuze session is coming soon to Android smartphones! Until then, create a free account on the web at Fuzebox.com or check our tablet app if you need to host a meeting on the go. • Join any Fuze session on 3G, 4G, or Wifi connection. • View any content shared including screen shares, videos, images or business documents. • If you are a presenter, you can advance slides, zoom on content and use the laser pointer. You can even upload any supported files from your phone. • Join the audio conference via VoIP or have Fuze call your smartphone. Once connected, you can mute or unmute your line. • Participate in a high definition video conference. You can watch everyone else or start your phone’s camera. Reorder the video feeds with the touch of a finger. • If your meeting host has Fuze Telepresence Connect, video participants may also include Telepresence endpoints. 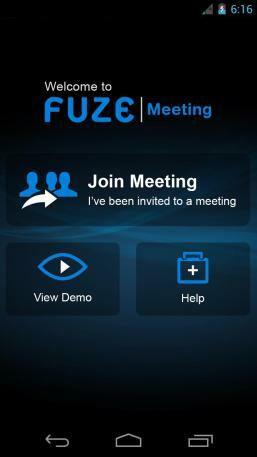 With Fuze on your Android smartphone, you never need to miss another important meeting!